Discussion in 'Shop Talk - BladeSmith Questions and Answers' started by Larrin, Jun 30, 2017. While the vanadium certainly should improve the wear resistance, it is a relatively low carbide volume steel, and shouldn't be confused with high vanadium steels like 10V or even 3V, as it has a lower volume of MC (vanadium-rich) carbides than any of those steels. It should have moderately-low wear resistance (most carbon or alloy steels like those mentioned in my "traditional" list have low wear resistance) and moderate toughness in a similar range to O1 or 52100. Initially, our toughness testing will not provide any comparisons with other alloys, though we hope that will come later. We chose four forging temperatures, two anneals, three austenitizing temperatures, and three tempering temperatures to compare, along with single vs multiple quenches. Some of the specific details of processing are going to be obscured when the results are presented publicly, how we will do that exactly will probably depend some on what we find. We created 1/4 thickness subsize unnotched charpy specimens, so obviously the numbers cannot be compared to something like Crucible c-notch full size charpy specimens. Subsize charpy specimens and unnotched testing are both included in the ASTM standard for impact testing, so while not entirely typical they are not exactly out of the norm either. Using the 1/4 thickness specimens means future tests will not be limited to thick material. This is important because many steels are only available as thin hot-rolled sheet. Furthermore, there may be some subtle differences between the much thicker material and the thinner knife stock due to the further forging reduction. Each processing condition has three specimens in the longitudinal direction and three transverse, which will provide some information on the directionality of properties of the steel, which gives clues as to cleanliness, carbide banding, etc. The samples have been produced and are on their way to me to be tested. Hardness measurements have also been performed and those are already yielding some interesting findings. This steel doesn't have a lot of information on it out there so we are very excited to see what we get! Larrin, I look forward to seeing your results. All I can say is try hand sanding that stuff at like 61-62 and tell us it doesn't have abrasion resistance at least to equal 3V. I forged all samples from round stock. The heat source was an electric furnace to ensure accuracy. In all, Larrin prescribed 12 schedules with differing forging temperatures, annealing types, austenitizing temperatures, and tempering temperatures. All samples were cryo-quenched. So far results are not what I expected. Forging was done under a 330# Beche open die hammer and a 50 hp Lewis rolling mill. MC carbides are harder than most abrasives which becomes very apparent when hand sanding. It seems that it doesn't take very much of it to make polishing more difficult. In a good or bad way? I look forward to your input as to the suitability of this stuff for kitchen knives as I am sitting on about 250 pounds of bar stock. yes, much more so that the fair amount of tungsten in 115W8!!! Results were not linear. Also, higher than expected attainable hardness. Hoss, have you talked to Adam Desrosiers about this stuff? IIRC, he had some interesting results as far as how hard you could leave it and how "soft" you didn't want to go. Dan Farr was a participant in the CFV development and has used a lot. Kevin Cashen was also in early on, but he was not keen on the whole "get hot, get wet" concept of a steel that could be processed with rudimentary HT equipment and felt that this stuff really wouldn't show it's full potential unless you treated it properly. Unfortunately, the Crucible bankruptcy killed lot of the interest in the steel. Perhaps your tests might show us something that would inspire someone bring it back. Unfortunately, the Crucible bankruptcy killed lot of the interest in the steel. I' say the interest is strong and increasing. I'm very interested to read the results of the testing. Yeah, Survive! making that batch of CFV knives probably didn't hurt as far as sparking the interest of some more folks. You've got my attention as well. Crucible........make more of the stuff, for the love of God. Here are some of the hardness results, the temperatures used are not shown for now. For each condition they were given the same heat treatment but with one variable that was changed. They were given the full heat treatment through tempering prior to the hardness testing. For austenitizing temperature, as you increase the austenitizing temperature you get more carbon in solution, but once you reach a certain level the hardness can actually go down due to excess retained austenite. Retained austenite is usually good from a toughness perspective but is generally thought to be undesireable in a finished blade because if it transformed under stress than the fresh martensite would be brittle leading to easy crack initiation. Excessively high austenitizing temperature also leads to brittle plate martensite and grain growth. The most clearcut to interpret is of course the difference with tempering temperature. With higher tempering temperature more carbon precipitates out of the martensite as precipitation carbides, lowering the carbon content and tetragonality of the martensite, which lowers the hardness. One anneal led to slightly higher final hardness than the other. The same anneal led to higher hardness in the as-annealed material. The larger the carbides in the annealed condition the lower the hardness is, so this may indicate that the one anneal led to a finer array of smaller carbides. We will see what the toughness numbers show. The interesting thing about the different forging temperatures is there seems to be a peak at the medium temperature. I had expected that if there were any differences that the increase in hardness would continue to the lowest forging temperature, but that was not the case. Higher forging temperatures lead to larger grains (lower hardness) but also dissolves more carbides. This carbide dissolution can sometimes lead to larger carbides because there is sufficiently high temperature for ripening of the carbides, which is thermodynamically favorable. However, if the temperature is too low then the carbides won't be broken up at all. So it might be that we found the optimum forging temperature. Or it might be an outlier. Other conditions with the same forging temperature also had a little higher hardness, but they also had the anneal that led to higher hardness, so it is hard to know. A multiple quench led to slightly higher hardness, which is expected since it is supposed to lead to grain refinement (higher hardness) and also likely more dissolution of carbides which gives more carbon in solution. I'm looking forward to the results. I did similar experiments with W2 a few years back, and this year with z-wear. It's a lot of work. Thank you for doing this. I would love to see this steel produced again. How did you measure the toughness? In very rudimentary ways, flexing the edge against granite and hammering through brass rods and framing nails. The increase and decrease in Rc#'s at different austenitizing temps was the more scientific part of my process. Larrin, what do you suggest for testing? I'm looking to be more scientific with this. Well of course the best way is with a charpy tester! As far as more "backyard" methods I haven't experimented much. My father has made small coupons and hit them with a hammer with approximately the same force until they broke and recorded the number of blows. If it were me I would at least want a rudimentary swinging arm to keep the force the same each time. Use the same sample geometry each time, hold it at the same point in the vice, and finish samples to the same grit. Use multiple samples (at least 3) and record the average. That would give you a quantitative measure and wouldn't necessitate finishing a knife to test it. Alternatively you could attempt to fabricate your own (non-standard) impact tester that would need to have sufficient weight to break on the first blow and record how high it reaches on the follow through (farther means the sample required less force to break). This is how charpy or izod works. I started rigging up an arm with a roller bearing pivot to hold test samples that I could attach weight to so gravity would provide a more consistent force. I've got 15 test pieces in z-wear, cru-wear, and 3v to test. 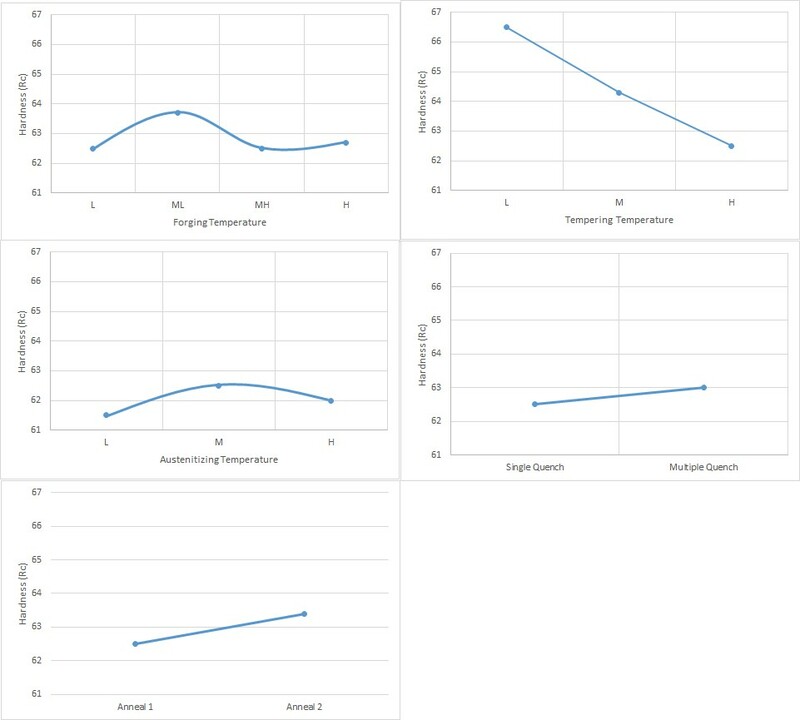 Here is the first result we are sharing: the effect of austenitizing temperature. 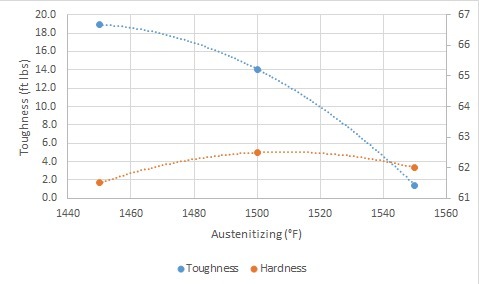 While increasing from 1450 to 1500F gave a relatively typical increase in hardness and corresponding decrease in toughness, the toughness fell off a cliff when it was austenitized at 1550F. This was somewhat surprising because the datasheet says to use 1500-1550F. We can state relatively definitively that the recommended range is too high. The furnace used has been checked with secondary thermocouples and has been found to be plus or minus 5 degrees or so near the thermocouple. There are a handful of things that could have led to the drop in toughness: 1) Grain growth, which leads to easy paths for crack propagation. Small grain means lots of boundaries for a more torturous path for a crack to traverse. 2) Plate martensite formation from excess carbon in the martensite. Lower carbon lath martensite is much tougher; often "quench cracks" can be seen in plate martensite. And/or 3) Excess retained austenite. If large, blocky, retained austenite is present it is unstable and rather than contributing to toughness it can hinder it. Because of the cryo treatment high retained austenite is not as expected but the high austenitizing temperature led to slightly lower hardness which can be a sign of retained austenite.